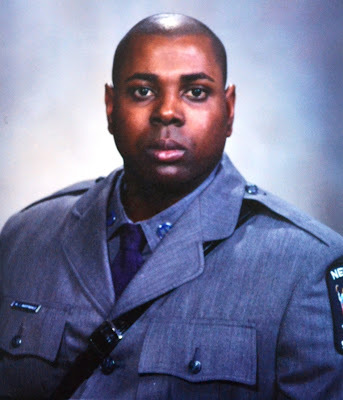 New York State Police Superintendent Joseph A. D’Amico is saddened to announce the death of Trooper Winston I. Martindale, Jr. of Troop F-New Hampton. Trooper Martindale died Wednesday, July 24, 2013, of complications from an on-duty injury he sustained in 2011. On May 9, 2011, while responding to the crash of two small airplanes in the Town of Waywanda, Trooper Martindale fell on a piece of equipment, causing internal bleeding to his abdomen. Though seriously injured, Trooper Martindale struggled with heavy wreckage to assist victims of the plane crash and stayed at the crash scene for six hours. Ultimately, both pilots of the single engine airplanes were killed. After suffering through several serious medical procedures to combat his injuries and further complications, Trooper Martindale lost his courageous battle following surgery at Mount Sinai Hospital in New York. He was 40 years old. Trooper Martindale was a seven-year veteran of the New York State Police and as a member of the U.S. Army Reserves, he served in Operation Enduring Freedom. He is survived by his wife, Michelle, 19-year-old son, Kyle, 16-year-old daughter, Moriah, his parents, Barbara and Winston, Sr., his sister, Camille, and his brother, Owen.